Sorry, this product is no longer available, If you currently own this product and need to renew your services or subscriptions, pricing can be found below. FortiMail Cloud Email Security is an independently validated and top-rated Secure Email Gateway solution delivering >99% catch rate, multiple layers of malware detection and an extremely low false positive rate. 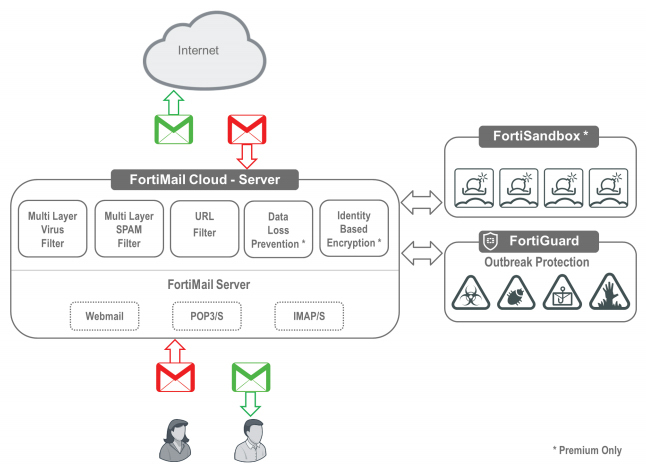 Fully managed by Fortinet, FortiMail Cloud Email Security allows you to focus on your business by relying on a trusted security expert to manage this key infrastructure security component. Gateway — Route your email to Fortinet where it is cleaned of malware and spam and forwarded onwards to your mail servers. Server — Host your email infrastructure and security with Fortinet while benefiting from malware and spam protection as well as protection of sensitive information. Market-leading spam detection FortiMail delivers highly accurate spam detection (99.8% July 20151) via the use of multiple fully integrated, advanced detection techniques. These include FortiGuard Antispam, sender reputation, URL analysis and more. Top-rated Threat Prevention FortiMail cloud security scans inbound and outbound email for malware using FortiGuard Antivirus — consistently top-rated by Virus Bulletin — together with cloud sample lookups and real-time outbreak protections. Customers can optionally integrate with Fortinet's NSS Labs Recommended FortiSandbox for the very highest degree of protection. Fully-managed service The FortiMail Cloud service is a fully-managed service backed by 24x7 support across the globe. Encryption options Server to server encryption via TLS encryption ensures data privacy where possible. For enhanced security, Identity-Based Encryption option can be added to deliver secure messaging all the way to the recipient's desktop. 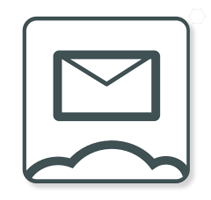 The FortiMail Cloud — Gateway service provides cloud-based email security for customers with either on-premise or hosted email deployments. The service acts as an inbound and outbound gateway for customer email and cleans it of spam and malware before forwarding to its destination. The FortiMail Cloud — Server service provides a fully-hosted Email Server combined with cloud-based email security. The service replaces the need to manage and maintain all on-premise email servers delivering email and security services from the FortiMail cloud. 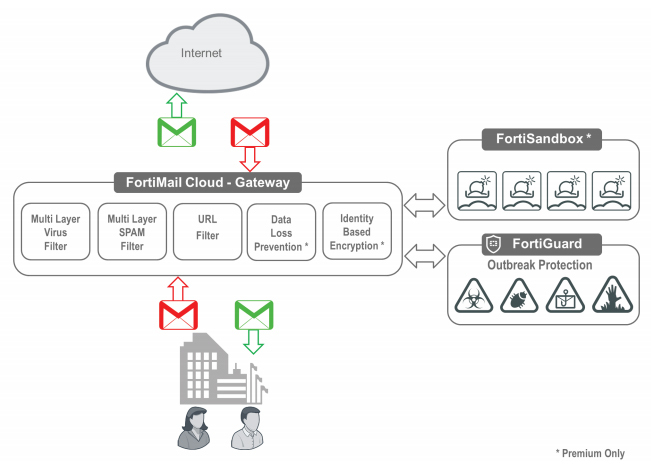 Download the Fortinet FortiMail Cloud Gateway Datasheet (PDF).